Portrait of artist Nicola Woods. Photo by Melissa Maltby. 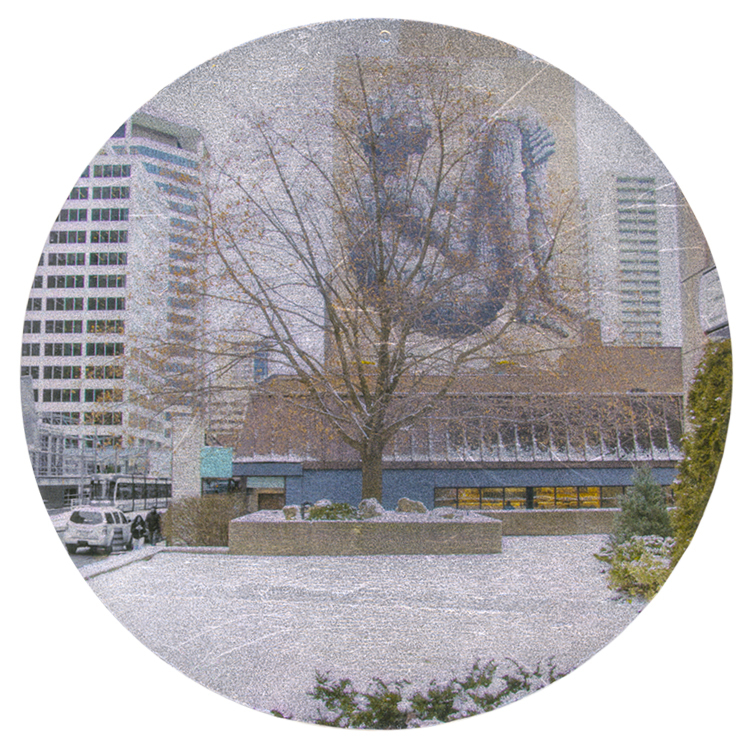 Can you describe your practice and why you wanted to get involved with DesignTO at Yonge + St. Clair? For several years I have been photographing trees and in particular street trees. 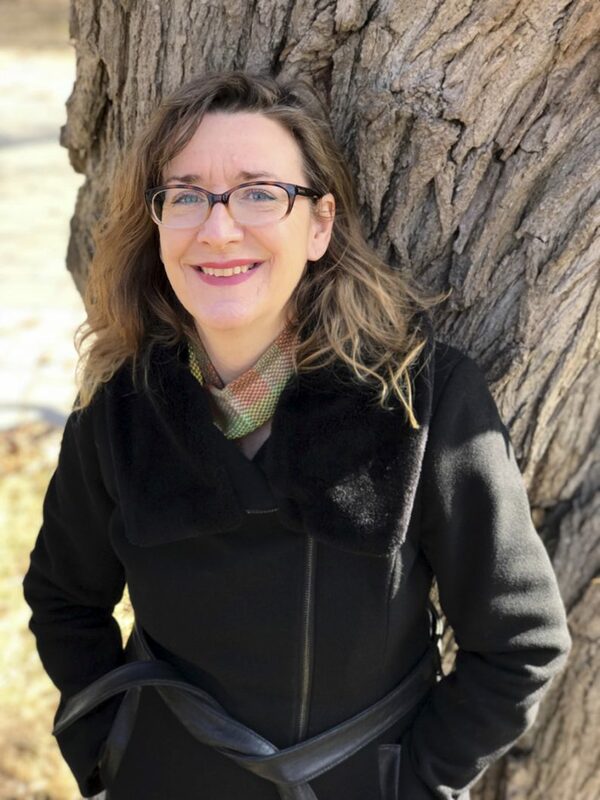 In May 2018 as part of the Scotiabank CONTACT Photography Festival, I exhibited 75 portraits of street trees in the Junction neighbourhood where I live. This exhibit grew from daily walks with my dog where I noticed the street trees that were part of an Adopt-a-Street-Tree program a joint collaboration between LEAF, the City of Toronto, Green 13 and the Junction BIA. And so, a concept grew in my mind to both record and pay homage to this group of trees cared for by various businesses, organizations and volunteers in the Junction. I wanted to honour how the trees knit the neighbourhood together. When I saw the call for submissions for DesignTO at Yonge + St. Clair, I thought what a great opportunity to discover and highlight another neighbourhood’s trees. I was especially pleased that Mary Be Kitchen offered to host my exhibition because they have a striking maple tree growing beside the restaurant. In the summer and fall the tree’s leaves provide shade to the side of the restaurant and at street level in the winter the bare branches reveal the amazing mural by Phlegm. 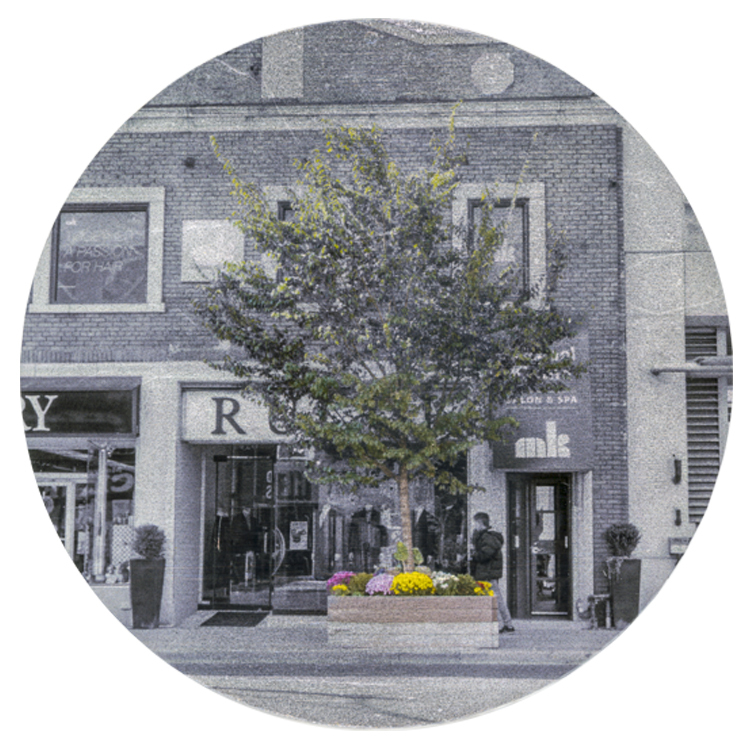 In addition to the maple tree my exhibition highlights sixteen other trees, mostly the ones planted along Yonge Street. I hope my installation heightens an awareness of the benefits that street trees provide and show how they bring colour and life to the neighbourhood. And I hope it will have the same effect that the trees have on me — that viewers become more mindful of the trees that live amongst us. Can you describe what the build process looks like for your installation? How did the idea come about, and what did it take to see it come to life? I started by exploring the neighbourhood and photographing the trees. Yonge and St. Clair has an interesting combination of old and new buildings and the trees mirror this. I found an interesting mix of mature trees (mostly honey locusts) and some new plantings in attractive wooden containers. Once I finished photographing the next step in my process was to edit my photographs and digitally render them so that the trees are in colour and the surrounding streetscape is in black and white; a technique that results in a digital version of the hand coloured photograph. To add another vintage element to my work I used metal leaf as a background. 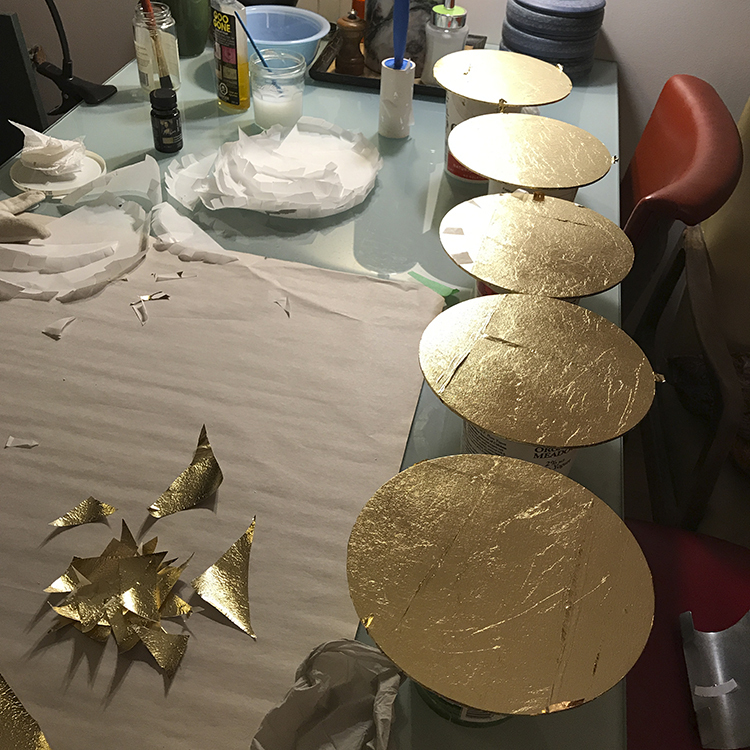 I applied the metal leaf to 7-inch wooden circles or rounds. 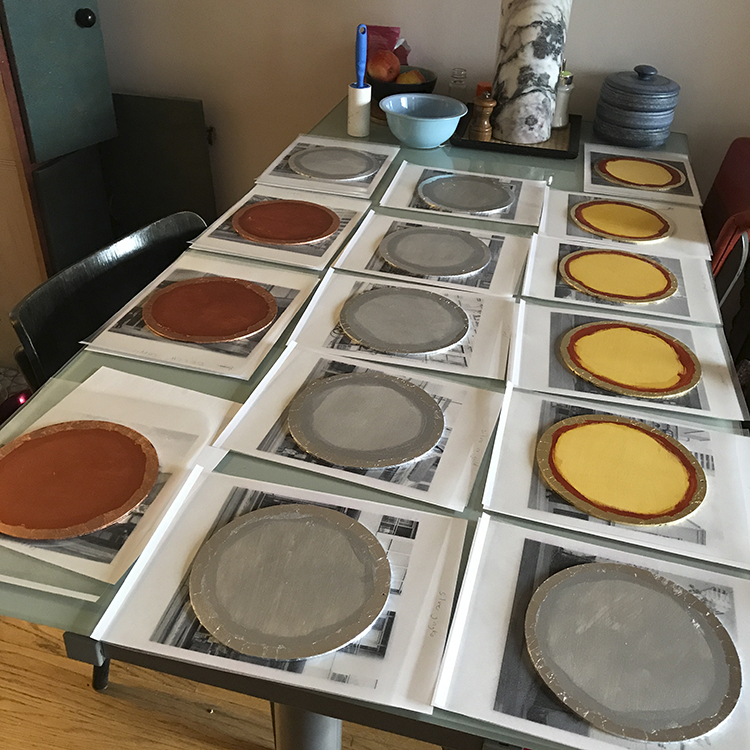 The gold, silver and copper metallic backgrounds shimmer and change according to the light conditions and resemble early photographic processes such as daguerreotypes and tintypes. And then I finished up the pieces by printing my photographs onto transparent film which allows the metal leaf to shine through the image. The final step in the process was installing the framed pieces in Mary Be Kitchen. I consulted with the owners to make sure they were happy with the placement of pieces and after several hours of work I’m happy to say my installation is up and ready for both restaurant patrons and DesignTO festival goers to enjoy.